Is it TIMED? Yes. Click here for 2019 Race Results. Can we bring the kids? You betcha! Papago Park is a lovely metropolitan park – plan to stay after the run to feed the ducks and have a picnic. Or go to the zoo! The course is stroller friendly, we just ask that you let the speedsters go off first! I am not in shape…. Can I still race? Of course – round is a shape! And that’s what New Year’s resolutions are all about, getting yourself in better shape. From racing stallions to couch potatoes, everyone is welcome. Do we get any good swag? 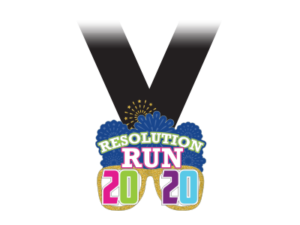 Yes, everyone gets a logo’d tshirt and a finishers medal plus we’ll have age division medals (age categories for every 10 years). You won’t want to miss Portillo’s chocolate cake! Want to keep that resolution going? Check out our other runs! Race is limited to 300 runners and walkers. No race day registration. Pick up your packet on race day after 7 am, or on Saturday January 4th at Fleet Feet in Scottsdale (18261 N Pima Rd E 135, Scottsdale, AZ 85255) between 2 and 4 pm. Bring your New Year’s Resolution… you can write it on a blank bib to wear during the run. Write it down. Make it real. Make it happen!